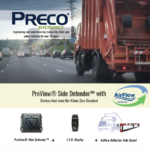 PreView Side Defender, the industry’s most advanced side collision avoidance solution, has been developed specifically for the over-the-road (OTR) market including trucking, municipalities, waste, and recycling. The Side Defender system actively warns operators with audible and visual alerts, in order for them to take the appropriate actions to mitigate collisions. Additionally, it has the ability to integrate with telematics applications, vehicle control systems, vision systems or other sensors using industry standard communications. Highway Mode: The system alerts operators of vehicles in the side blind zones while ignoring stationary objects such as guardrails to reduce nuisance alerts. Slow-Speed Mode: PreView Side Defender is positioned to play an integral role in the emerging side turn assist applications, aimed specifically at reducing the incidence of collisions with pedestrians and cyclists in urban environments.